Last year’s pairs event at Nationals was so surprising! Who expected Leng/LeDuc to come out of nowhere and skate a brilliant, third-place short program? Who expected Zhang/Bartholomay to make the Olympic team ahead of Denney/Coughlin? With all the surprises last season, I wasn’t planning on even trying to predict what would happen this year! Plus, I don’t want to jinx anyone. I’m really a supporter of all U.S. pairs. I may have my favorites—what skating fan doesn’t?–but I genuinely want all our pairs to do well. What conclusions did I reach? Let’s see! Everyone seems to believe the title is between Alexa Scimeca/Chris Knierim and Haven Denney/Brandon Frazier. Last year, Scimeca/Knierim placed fourth; Denney/Frazier were fifth. This year, the two teams have been close again. Both won their first Challenger Series event and medaled in their second. Denney/Frazier then had a great competition at Skate America, winning silver over Alexa/Chris, who were a disappointing 4th. Both teams placed 4th at their second GP events. Denney/Frazier have shown so much improvement this season. Their programs have interesting transitions, are well-constructed, and display a newfound maturity. Their Lion King LP, in particular, is a fan favorite. The program builds dramatically to a strong finish, which has helped carry D/F past some mistakes at times and still leave a good impression. Scimeca/Knierim’s programs have not been quite as well received. Unfortunately they had mistakes in their early outings, which hurt the initial impression. The programs have many interesting moments. I especially enjoy the lightness and charm of their An American in Paris LP, and their SP was much improved at TEB. But realistically, S/K’s programs are probably a net neutral for them. Where S/K have shown progress is on the technical side. They’ve added a difficult new lift, with Alexa in upside-down position and Chris supporting her one-handed. Also, the big news: They announced this week they will add a quad twist to their free skate (as well as a 2A/2A sequence). It’s been 2 months since these teams competed, so it’s hard to say who has momentum. Denney/Frazier caught everyone’s attention with their silver at Skate America. It was the highest GP finish for a U.S. pair since 2008. However, Rostelecom was a step backward: They failed to capitalize on their SA success, made mistakes, and missed the bronze medal by a painfully close .02 margin. Scimeca/Knierim, meanwhile, followed up their SA disappointment with a generally cleaner, stronger performance at Trophee Eric Bompard. I feel the momentum is slightly with Scimeca/Knierim. Haven & Brandon are steady competitors. An impressive stat about their season is that they’ve fallen only one time in 4 competitions. They’ve had their struggles with SBS jumps, but the mistakes have mostly been pops or stumbles, not falls. Alexa & Chris, meanwhile, have suffered many disruptive falls on jumps. I think S/K’s nerves have hurt them not only technically but artistically. The nervous tension has been obvious at times, and I think it’s held them back from expressing their programs as well as they could. How close are these two teams by the numbers? Quite close. Let’s consider PCS. Although Denney/Frazier’s programs are generally considered superior, these teams’ average total PCS scores this season are almost identical. Scimeca/Knierim’s average total PCS per competition is 83.3. Denney/Frazier’s average is 83.2. So, they are effectively tied in PCS. Given the closeness in these pairs’ scores, Scimeca/Knierim upgrading to a quad twist in the free skate is important. Let’s assume S/K land the quad and get maybe a level 2 on it. That would add 1.4 points in base value to the 3-point technical cushion they typically hold over D/F. It’s significant. My feeling is that Scimeca/Knierim will defeat Denney/Frazier for the title. I think it will be close. And Denney/Frazier may well prevail if S/K succumb to nerves again and fall on their jumps (a distinct possibility). However, I think the quad twist, their greater maturity, and the slightly higher quality of their technical elements will carry Scimeca/Knierim to the title. 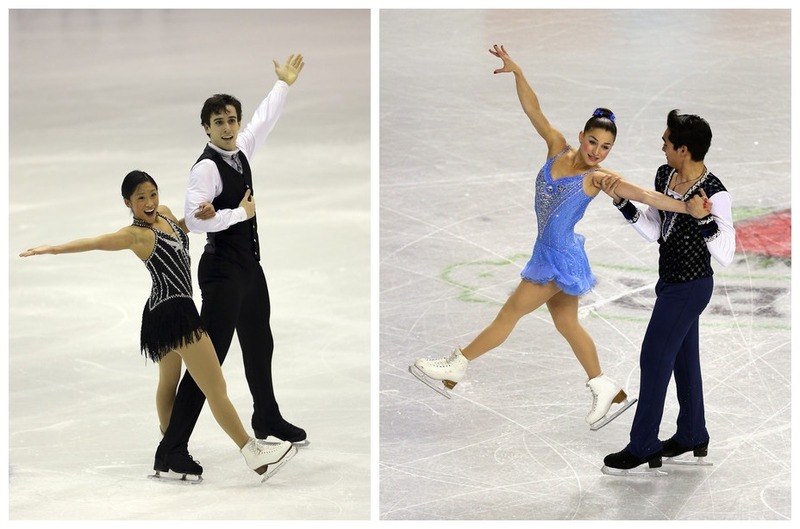 Two other American pairs skated a full international season this year: Jessica Calalang/Zack Sidhu and Madeline Aaron/Max Settlage. Both teams did two Challenger Series and two Grand Prix events. With both teams competition-tested, they could battle for the bronze in Greensboro. Calalang/Sidhu were only 11th last year. However, they moved up quickly this season, with so many teams ahead of them split/injured. Surprisingly, they medaled in both their CS events. They then finished 5th/7th at Cup of China and Rostelecom. In their first senior season, Aaron/Settlage did not medal at their CS events. However, they finished 5th/4th at Skate America and Skate Canada. Calalang/Sidhu won many new fans this season. Jessica has a sparkly, sweet presence on the ice, which adds much to their appeal. Their programs and packaging are rather generic, however. The SP is set to show music, and the LP is yet another rendition of Nino Rota’s Romeo & Juliet. Neither program is particularly interesting. Calalang/Sidhu attempt all the difficult technical elements. However, their fundamentals are not the strongest; they lack speed and edge quality in their basic footwork. Aaron/Settlage are skating to Coppelia and The King and I. Their programs show off their youthful chemistry and energy and Maddie’s balletic carriage and extensions. This pair has improved from event to event and made a strong impression on both fans and judges. They skate with a lot of energy and commitment. Their technical elements are not the biggest or highest, but are pretty consistent. I think both teams come into Nationals with similar momentum. Both teams had fairly strong performances in their second GP events. A poster on FSU reported that Aaron/Settlage have been looking very good in practice. No reports on Calalang/Sidhu. Looking at the numbers, these pairs are very close. Although Aaron/Settlage’s programs have received more praise, the two teams surprisingly have exactly the same average total PCS score per competition this season: 77.3. Both teams also have exactly the same average number of falls per competition: 1.3. The difference comes on the technical side. Calalang/Sidhu have just over a 1-point advantage in average base value and average GOE. As a result, their average total TES score per competition is currently 78.4, versus 76.0 for Aaron/Settlage. These numbers suggest Calalang/Sidhu might finish ahead of Aaron/Settlage at Nationals. However, my feeling is that Aaron/Settlage will likely overcome the TES disadvantage and beat Calalang/Sidhu. It comes down to performance level. Assuming the two teams perform similar elements, I think Aaron/Settlage will make a stronger impression artistically because they have better basic skills, better musicality, better programs, and a generally higher performance level. I think internationally, A/S have been marked down a little in PCS because they are: 1) a new, young-looking team just up from juniors, 2) do not have the biggest lifts or twist, and 3) are a rather short, small team (just 4’10”/5’9”). Those factors are all more important internationally than nationally. At Nationals, I think what’s going to matter is which team performs the cleanest and connects most with the audience. And of these two, I see Aaron/Settlage as crowd favorites, with their high-energy, fun, character-driven programs. Because Calalang/Sidhu and Aaron/Settlage have competed so much this season, normally I’d expect one of them to get the bronze. However, if there’s one team that could spoil their party, it’s Tarah Kayne/Danny O’Shea. Kayne/O’Shea were a strong 6th last year at Nationals and won silver at 4CCs. Unfortunately Tarah had to undergo hip labrum surgery over the summer, which cost them many months of training. They came back to win bronze at Golden Spin of Zagreb, the last Challenger Series event of the year. How do Tarah & Danny fit into the picture at Nationals? It’s so hard to say, with just one competition to go on—and no video from that competition! At Golden Spin, they struggled with their SBS jumps. And their triple twist was only a level 1 in both segments. However, they did land several throw jumps and were successful on all their other elements. K/O’s total TES/PCS scores at Golden Spin were several points better than Aaron/Settlage’s and Calalang/Sidhu’s total TES/PCS averages for the season. But again, it’s just one competition. How much weight does it bear? I don’t know. But I’m going to go out on a limb and predict that Kayne/O’Shea will pass both of those teams to win bronze. Again, I say this based on general quality and performance level. Kayne/O’Shea, at their best, are a talented team. They are crisp, sharp, polished, musical, and definitely more mature than either C/S or A/S. Plus, Tarah has that special star quality that simply can’t be taught. Also, I think they are extremely motivated to come back from this injury and not lose any more time proving themselves on the world stage. I just have this feeling that they’re going to put it all out there to try and make that 4CC team, if not the World team. So much depends on Tarah’s physical readiness, of course. If it’s there, I see them on the podium. After a two-year reign as U.S. pairs champions, Marissa Castelli and Simon Shnapir ended their tumultuous partnership this spring. Simon paired with DeeDee Leng (8th last year) and Marissa is skating with Mervin Tran (former World bronze medalist for Japan). How do the former champions fit into this year’s event? Tough to say. Leng/Shnapir were not able to skate a full season due to DeeDee fracturing her pelvis (ouch!). In their 2 GP events, L/S did not place well: 8th/last at Rostelecom, 6th/next-to-last at NHK. Meanwhile Castelli/Tran could not compete internationally, as Tran does not expect his release from Canada until this summer. Mervin/Marissa debuted their programs and skated fairly well at Boston Open, a club competition. However, their performances at U.S. Sectionals were quite disappointing. Leng/Shnapir are skating to Carmina Burana and Miss Saigon. At this stage, the programs are a backdrop more than anything else. DeeDee & Simon are still working just on getting the elements and their timing. So far, they’re only performing double twist and throw double loop. They’ll need to upgrade those elements to get into contention. Castelli/Tran, meanwhile, have strong material. Their Summertime SP shows off their skating skills and footwork. And their tango LP could potentially be a very nice package. Despite their newness as a team, Marissa & Mervin are going for high-level elements: triple twist, level 4 lifts, throw 3Lz. However, they haven’t been consistent yet at hitting those elements, so it’s hard to know what they will do at Nationals. What they do have is huge potential. As I said in an earlier post, I do believe the quality of their basic skating and edges is potentially among the best in the world. Individually, they are exceptionally strong skaters. Neither team enters Nationals with any momentum. After Rostelecom, Leng/Shnapir were criticized for perhaps competing too soon. And Marissa/Mervin’s poor LP at Sectionals took much of the buzz off their new partnership. The numbers so far indicate Leng/Shnapir are not ready to contend at Nationals. Their average total TES score so far this season is just 65.2. Their average total PCS is 70.6. For Castelli/Tran, we have only the results of U.S. Sectionals to look at. Their total TES at Sectionals was 71.5—not competitive. However, their total PCS was 80.5—much better. Comparing Sectionals scores to international scores is dicey. But the higher PCS is definitely reflective of the quality of their basic skating. I’m going to put my money on Marissa & Mervin to surprise people with a top 5 finish at Nationals. These two are experienced competitors with a lot of pride, and I expect them to rebound from Sectionals and skate much better in Greensboro. Despite these predix, though, I will love it if the U.S. pairs surprise us with exciting and unexpected performances this week and it all turns out differently!! Numbers and predictions are one thing. But great performances transcend all that and are what we fans live for! In fall 2013, a milestone passed: The 10th anniversary of the International Judging System (IJS). The IJS was first used at the 2003 Nebelhorn Trophy event, on Sept. 3-6, 2003. This year will mark the 10th anniversary of the IJS at Worlds. I’ve been a supporter of IJS from the beginning. I always found the 6.0 system to be an utterly abitrary and inexplicable system of judging. Yet, this season, I find myself questioning IJS and its effect on the sport like never before. Because the product is suffering. The skating is suffering. The programs and performances we’ve seen this year are not what I want to see in this sport. Of course, lots of fans may feel differently. But that’s how I feel, personally, as a fan. The Grand Prix season this fall had many great moments, as always. Yet, when you look at the performances as a whole, something was missing. The ladies’ field was weak–as a whole. At Rostelecom Cup, Cup of China, and NHK Trophy, the nonmedalists’ performances were riddled with a myriad of mistakes and falls. Most of the programs themselves were utterly forgettable–one tired retread after another of Firebird, Carmen, POTO, Four Seasons. Although we saw some clean winning skates from the top ladies, we saw very few great programs. The same applied to the men. Men’s programs have become so technically difficult that, in most cases, they cannot perform them well. The men’s event nowadays is a roller coaster of disappointing performances interspersed with the occasional, rare, brilliant program. Few men can maintain any consistency. We saw men follow up outstanding, Grand Prix-winning performances at one event with near-total collapses at the next. And, like the ladies, only a few men put out great, memorable programs. It’s the lack of artistically satisfying programs that’s bothering me most this season. Ryan Stevens recently wrote a great article about this issue at his Skate Guard blog (http://skateguard1.blogspot.ca/2014/12/i-can-do-better-talking-about-ijs.html). The question is, why are some of us just noticing this problem now? I think one reason is that, in the last few years, we were blessed to have some of the most legendary, exceptional talent that’s ever been seen in this sport: Yuna Kim, Carolina Kostner, Mao Asada, Akiko Suzuki, Patrick Chan, Daisuke Takahashi, Savchenko/Szolkowy, Virtue/Moir, Davis/White. All of these skaters were so talented, they could deliver the technical elements necessary under IJS and still create superlative, beautiful artistic programs. Because these skaters were so exceptionally gifted, they made it seem like IJS was working. But now that great generation of skaters is gone. And what is left? Jumps, spins, footwork–and a lot of programs that are barely worth watching. Is the lack of good performances because of IJS, or something else? Reluctantly, I’ve come to conclude that IJS is the root of the problem. What I’ve always liked most about IJS was that it evaluated and rewarded all aspects of skating—spins, footwork, lifts, as well as jumps. Under 6.0, you could have the greatest spins in the world (like Lucinda Ruh), yet you wouldn’t get much credit unless you could also land triple Lutzes and flips. The fact that IJS quantified and rewarded all the components of skating initially seemed like a big step forward. But there’s been an unanticipated side effect. Because everything is now evaluated, everything can now–theoretically–be perfect. Skaters know how much an element is worth in base value and how much extra they can get in GOE. They know the perfect—or maximum–score. The simple existence of this maximum score necessarily means that that is what they must strive to achieve. Haven’t skaters always tried to perform as perfectly as possible? I suppose this should be a skater’s goal under any system. But what’s different about IJS is it spells out what perfection is for an element and the points skaters can get for it. So, whereas the pursuit of perfection under 6.0 was theoretically possible, it’s only under IJS that it’s become an actual logical necessity. The pursuit of perfection under IJS has been spurred because–increasingly in the last quad–certain skaters actually attained technical perfection in certain elements. In the Sochi team event long program, Yulia Lipnitskaya received the maximum score possible for her Biellmann spin: Level 4 and all +3s in GOE, for a total of 4.20 points. She could not have scored any higher. Volosozhar/Trankov did the same with their triple twist: At Skate America 2013 and twice in Sochi, they received level 4 and straight +3s for their twist. Yuna Kim also came close to scoring the maximum with her 3Lz/3T in her 2013 Worlds LP; she had nearly all +3s. So, the quest for technically perfect elements not only makes logical sense under IJS, it’s also now actually acheivable. And, because some competitors have achieved such virtuosity, the pressure is now on for all other skaters to reach for perfection as well. Because, as a pair, how can you beat Volosozhar/Trankov–with their perfect triple twist and near-perfect difficult lifts—unless you can do those elements or other elements perfectly, too? Good is no longer good enough. Increasingly, perfection is necessary. How does the quest for perfection affect skaters? The first effect is almost automatic: As skaters work harder and harder to improve and refine their technical elements, the rest of their skating almost inevitably suffers. Some skaters still find the energy to create great programs and perform them at an extremely high level. However, for the majority, the program becomes little more than a framework for the elements. Consider a skater like Javier Fernandez. Even Fernandez, as great as he is–with charisma to spare, quality choreography, and great PCS–cannot give his programs the full artistic expression they could potentially have. This is particularly so in the long program–a minefield of quads and triples. Although I enjoy the character he’s portraying in his Barber of Seville program, I’m convinced it could be so much better if Javi only had the energy and freedom to really perform the program full out. But he must save much of his energy for three quad attempts. At least he presents interesting, character-driven, musically and choreographically engaging programs. 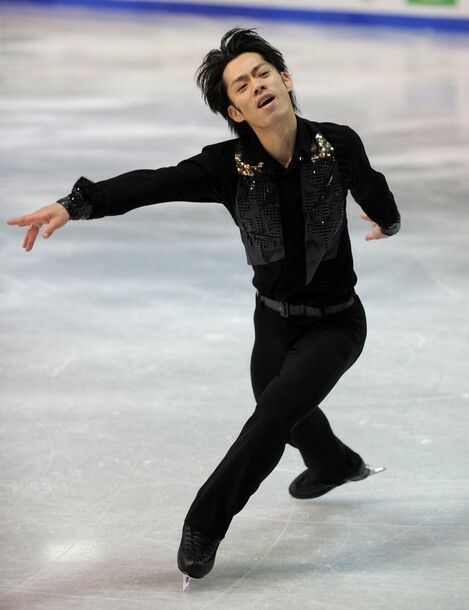 Although many skaters pay lip service in interviews to developing their programs and their overall skating, in actuality, their focus is very obviously on the elements. They whip through their programs with lots of arm movements and counters and rockers, but what they’re really focused on is jumps and spins. The audience can sense the lack of connection between skater and music—even if the judges choose to ignore it. So, the quest for technical perfection leads in many cases to artistically unsatisfying performances. It also has another, almost worse effect: In some ways, it’s draining the joy out of skating. Years ago, you might see a great champion like Kristi Yamaguchi or Todd Eldredge skate pretty well but make a few mistakes in their program. They’d shrug afterward and look a bit rueful. But they’d still be smiling when they took their bows and went to the kiss-n-cry. Because they knew that, all things considered, they’d still put out a good performance overall. It’s not like I want skaters to be happy about making mistakes. But I also don’t want to see them destroyed or devastated by it, like Anna Pogorilaya was at the GP Final. Things have gotten to the point where anything less than perfect just doesn’t cut it. And that’s just a lot of pressure to put on anyone. I feel like the pressure for perfection has affected fans, too. Some fans seem to expect outstanding performances every time skaters take the ice. And the emphasis on technical elements has affected how we experience programs. Do we even watch a spin anymore for simple enjoyment of how it expresses the music? Or are we just looking at it as an element: How fast is she spinning? How high is she holding her leg? I’m not saying we shouldn’t appreciate the technical difficulty of spins. And it’s fun to read and evaluate protocols–I enjoy it, too. Yet at the same time, I don’t want to lose sight of the simple beauty of skating, beyond the elements. I’d feel more hopeful about the whole situation if the ISU showed any ability or willingness to make reforms within IJS. But I don’t see that. Instead, it seems like practically the only changes the ISU makes in the system are to rack up the difficulty and deductions. Has skating benefited in any way from the increased underrotation penalties this season? I’d argue it hasn’t. As I was briefly looking through the IJS updates this spring, I had to shake my head at ISU Communication No. 1860, which announced a new difficult feature in twizzles: “Executing Twizzles with the head bent all the way back with the face to the ceiling.” Hmm, that’s difficult—but isn’t it also a tad bit dangerous? If I were an ice dancer, I don’t think I’d want to be twizzling while staring at the ceiling. The ISU did later release a correction, changing it to: “[Twizzles with] the head clearly bent off the vertical axis to the side, to the front, or to the back.” Well, at least you don’t have to look at the ceiling to get the feature. But seriously, why is this change necessary in the first place, and what does it really add? In a recent blog post, noted technical coach Tom Zakrajsek suggested the U.S. stop using IJS at the lower levels of skating (http://coachtomz.com/category/blog/page/3/). Zakrajsek argues that the stringency and inherent harshness of the system discourages kids from competing. When kids don’t do well in lower-level competitions, and their protocols spell out exactly how far away they are from the desired level of competency/perfection—well, many choose to walk away from the sport rather than continue down an uncertain and difficult path. And I can’t argue that that decision doesn’t make sense. I don’t like seeing so many unhappy, sad faces after performances. I don’t like seeing so many robotic, mechanical, uninteresting programs. I love competitive figure skating, but I feel like something needs to change. I think many others feel the same. The product we have now—competitive skaters’ programs & performances—could be so much better. The IJS needs major reform, in my opinion. I would never want to see the sport return to 6.0. But there’s got to be a middle ground somewhere that will take us back in the direction we want to go: Toward skating that is technically accomplished–but also beautiful, memorable, and joyful. So, ’tis the season for Nationals! 🙂 Over the last few weeks, we saw Russian, Japanese, Chinese, Italian, and other national championships–with U.S. and Canadian Nationals still to come! Unfortunately, with all this happening at the same time as Christmas, New Year’s, family visits, and my kids’ school vacation, I could barely keep up with watching, much less writing about, the competitions! But here are some brief notes on the different pairs Nationals so far. Due to technical difficulties, I couldn’t watch the ESPN3 coverage of Russians (or videos derived therefrom) and had to rely on the Russian TV coverage on TVTeka. As a result, I missed all the short programs (except for Astakhova/Rogonov) and saw only the long programs. Stolbova/Klimov had uncharacteristic mistakes in their long program, with Ksenia stumbling out of the throw 3Lz and falling on the throw 3S. The good news: She hit the initial landing on both throws, so they received full credit in base value and were only marked down in GOE. This helped Ksenia/Fedor hang on for the win, although they were second in the LP. The rest of their elements were strong (although they received some lower levels than at GPF, costing them about 2.5 points’ base value). Despite the technical issues, their performance level was very high. They skated with a lot of conviction. And, especially compared to some of the newer Russian pairs, there is so much to admire in Ksenia & Fedor’s basic skating. Everything they do is so precise, polished, and passionate. Every movement is finished off fully, every position is established quickly and beautifully. They just work so well together. Although I think they probably benefited from some PCS reputation judging, at the same time, it’s hard to argue they don’t deserve such high marks. The quality of their basic pairs skating is certainly best-in-field right now. 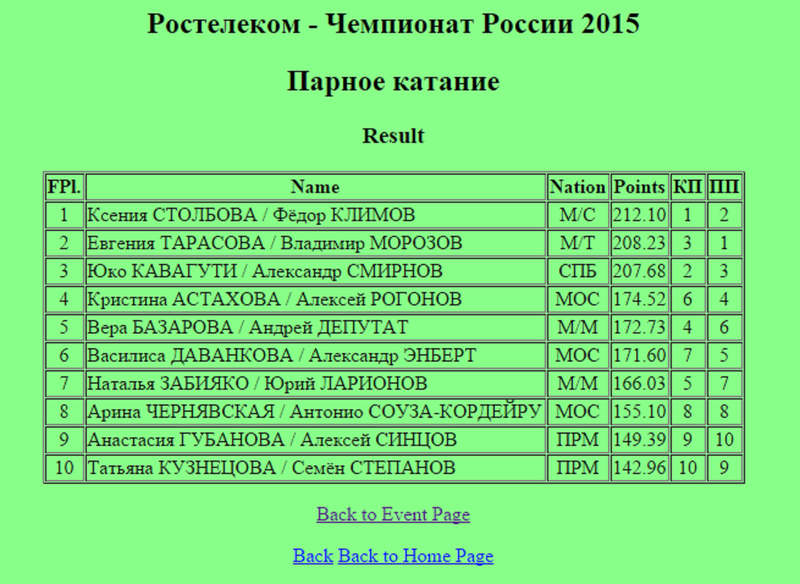 This was a breakthrough event for Tarasova/Morozov. They had a gorgeous, totally clean skate in the long program to win that segment and the silver medal overall: A great result for them in just their first senior season. They started off their LP with a superb level 4 triple twist. Everything about their twist is textbook—height, catch, speed—and they received almost straight +3s. Next, they landed SBS 3S and SBS 3T/2T. They’ve struggled with their SBS jumps this season, so it was great to see them land both sets well. Their throw 3Lp and throw 3S were also excellent. All three lifts were level 4 and simply beautiful to watch. Evgenia’s lift positions are some of the best in the world, and with Vladimir’s height and ice coverage, the lifts just look huge and gorgeous. This was certainly their best LP so far this season. The only negative is the Lionel Richie Hello muzak. It’s very monotone and subdued, and the program just kind of dies off at the end, rather than building to a high point. Nonetheless, T/M performed it very well. Following the event, Tarasova/Morozov were named to the Russian team for both Europeans and Winter Universiade. I’m a bit surprised they were assigned to Universiade. They will compete there with teammates Astakhova/Rogonov and Bazarova/Deputat. I am guessing the RSF may use this event as a final audition, of sorts, before naming T/M to the World team. Yuko & Sasha won only the bronze medal here, a bit disappointing. I’m sure they were hoping for silver or possibly gold. However, the performance level of their LP was much stronger than at NHK and GPF. So if I were them, I’d still feel happy with the result. In the long program, they again had problems on both SBS jumping passes. However, they recovered with a great throw 4S. This quad was their best yet this season. The jump is a little smaller than you would expect for a quad, but Yuko landed it beautifully, with runout. It received all positive GOE and was the highest-scoring element in the whole event at 9.43 points. Yuko also landed a good throw 3Lp, and all three lifts were well done, with great impact to the music. They also got through the SBS spins nicely, which has been a problem area the last few events. The only other weak element was, as usual, their triple twist. It was great to see them land the throw quad so well. Their Manfred Symphony LP is always exciting to watch, and I felt they skated it with a lot of abandon, emotion, and confidence, which made it even better. At NHK and GPF, they appeared cautious and tentative, but not so here. Hopefully they can build on this result and do well at Europeans. A/R were in sixth place after the SP, after trouble on the throw 3F. They pulled up to 4th in the long program and overall. They started their LP with a good SBS 3T/2T combo. The triple twist was a bit low and crashy and got only level 2. Kristina then doubled the planned SBS 3S. Their throw jumps were both successfully landed, although perhaps a bit small. The other elements were mostly good, except for a slight problem on the second lift. Their Master and Margarita LP was fairly strong technically, and the choreography/theme are interesting. However, it didn’t really sing, and overall I’m not as excited about this team as many people are. I’d like to see them develop more smoothness in their skating, a more seamless quality. I feel they move somewhat jerkily from element to element. As individual skaters, their styles also seem a bit different. Rogonov’s look is rather refined, whereas Astakhova is a solid skater but somewhat lacking in elegance and grace. Fortuitously (perhaps intentionally? ), their programs this year require showiness and high energy, rather than elegance. It will be interesting to see how this team progresses next season. In the meantime, they will compete at Winter Universiade. Vera & Andrei placed 4th in the SP; 5th in the LP and overall. I enjoyed their Adios Nonino LP. Vera two-footed the opening SBS 3T and SBS 2A/1Lp/2S but stayed upright. She also fell on the throw 3F. However, the throw 3Lp was nicely done. The lifts were mostly quite nice, although Vera’s swan position is a little weak (her other positions are fine). I thought the performance was still good, despite the technical flaws. Vera & Andrei have the smoothness and elegance that A/R lack, and they brought nice dramatic flair to the tango. Vera, in particular, really got into the character and sold it effectively. She was committed to the performance–showing, I think, her experience at this level. I thought this was their best LP of the season so far. Bazarova/Deputat have also been assigned to Universiade. This team was the surprise of the event for me. The last time I saw them was at Autumn Classic back in October. They looked improved here. Enbert spun out of their opening SBS 3S, but they recovered to land SBS 3T/2T. Both throw jumps were quite well done. Their throws aren’t huge, but Davankova landed them with great speed and flow, similar to Stolbova’s throws. The lifts were all level 4 and smoothly done, considering they are such a new team. They have very nice lines and flow; they just look good together. One thing holding them back is their triple twist; it got only level 1 and negative GOE in both programs. Still, I look forward to seeing more of this team next season. I think their packaging needs improvement. Their programs and costumes this season are attractive but rather bland. Unlike the other teams, Z/L did not compete internationally this season, as they await her release from Estonia. The rust showed in their LP. She spun out of the opening 3T; the landing was off on their triple twist. They had problems on the death spiral and SBS spins, and Zabijako put both hands down on the throw 3S. The lift transitions were shaky, and the final pairs combo spin finished after the music. Overall it was a weak and sloppy performance, and I’m not sure these two are well suited as a pair. Zabijako is willowy with long lines; Larionov is stocky. There’s no chemistry, either; they looked like two strangers skating together. I’ll be a bit surprised if this partnership survives very long. Altogether, it was an interesting long program event for the Russian pairs. The highlights for me were Tarasova/Morozov’s strong, clean performance and Kavaguti/Smirnov’s passionate LP. The new Russian pairs had ups and downs in their programs, but show progress and promise for the future. It was announced that Peng/Zhang and Sui/Han withdrew from Chinese Nationals to prepare for 4CCs and Worlds. Yu/Jin presumably locked up the third spot on the 4CC/World team by winning Nationals over Wang/Wang, who were second. I was only able to see video of Yu/Jin’s performances. Yu/Jin opened their Nationals SP with another excellent set of SBS 3Ts. The triple twist, throw 3Lp, and lift were all very good. They had a slight synchro loss on the SBS spins, and her position in the front outside death spiral was a bit weak. Although it was not their best SP, it was still very good. Judging from the video, there was almost no audience for Chinese Nationals, and therefore no crowd support. It looked more like a practice session than a competition. However, Yu/Jin kept their performance level up. And their Humility and Love LP once again cast a powerful spell, even in an empty arena. I love this program more and more every time I see it. And they performed it very well here. Their opening SBS 3Ts were superb—so close together, so synchronized. The SBS 2A/2A sequence was also good. The triple twist looked terrific; so did the throw 3Lp. They again had slight problems on the SBS spins. Their throw 3F is impressively high, although Yu did slightly two-foot it. Altogether it was another fine performance, and this team is looking very prepared for 4CCs and Worlds. I think 4CCs is going to be a very interesting pairs event. With Duhamel/Radford, the three Chinese pairs, perhaps Iliushechkina/Moscovitch, another Canadian pair, and the American pairs all in the mix, there’ll be some good skating. It’ll probably be a stronger event top to bottom than Europeans, as none of the Euro pairs can really put up a challenge to the Russians at this point. From the Japanese Nationals pairs event, I was only able to see video of Takahashi/Kihara’s LP. This was actually one of the better performances I’ve seen from Narumi and Ryuichi. Narumi again had trouble on both SBS jumps. However, their throw jumps were nicely landed, and their SBS spins were very well done. The rest of the elements were pretty clean, too (although they again did only a double twist). Ryuichi appeared a bit uncomfortable getting the lifts up, though. They drew energy from the home crowd and performed the program better than usual. Narumi even smiled quite a bit toward the end! Nice to see. So far, I’ve only been able to see video of the pairs SP from Italian Nationals. LP videos will hopefully be available soon. Perhaps a bit surprisingly, Marchei/Hotarek won Italian Nationals over the more experienced team of Della Monica/Guarise. M/H’s SP was not at a high technical level. Their throw jump was good, but they appeared to do only a double twist, and the SBS spins were quite off. However, the lift was well done, and Valentina had a great position on the death spiral. Perhaps most importantly, they really got into the character of their Malaguena program and performed it with a lot of electricity. They had flair and expression in their footwork; they both just really went for it. The last few years, Valentina has been one of the most artistically interesting performers in ladies, and I think that experience is going to help her project and sell their pairs programs. They skated with surprising confidence for such a new team. Nicole & Matteo’s short program wasn’t a disaster, but it wasn’t what they needed to beat Marchei/Hotarek. Their triple twist was low, and Nicole fell on the throw 3S. Her landing on the throw 3Lp was a bit low and not well controlled. The rest of the program was fine, but it didn’t sparkle in quite the same way as Marchei/Hotarek.